A screen shot showing 3D modelling in progress. 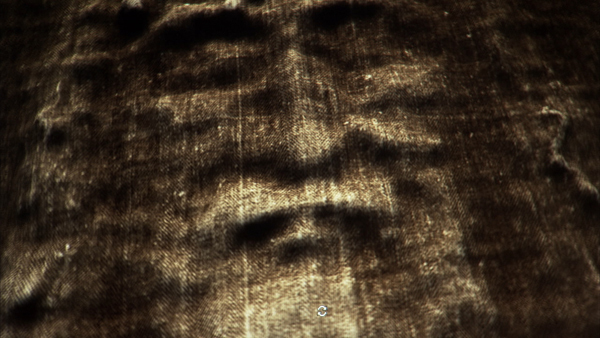 ‘You have to really seek the face of Jesus if you’re going to find it,’ says 3D computer graphics artist Ray Downing, the man responsible for an ambitious project to recreate the actual face of Jesus from the faint image on the Shroud of Turin. ‘Something extraordinary had happened here. Something beyond human reason,’ said Ray describing his experience in working with the Shroud. The incredible results feature in the History Channel’s premiere documentary, The Real face of Jesus, which screened in the US on March 30 and will again on April 3. It is unclear when it will screen in Australia. The History Channel said, ‘For the devout and curious alike, this documentary feature may bring us the closest we have ever come to seeing what Jesus actually looked like. The Shroud of Turin is an ancient 14-foot linen cloth believed by millions to be the burial shroud of Jesus Christ. Imprinted on the torn, blood and water stained fabric is a faint image of a crucified man. The question of whether this man is or is not Jesus has been debated for centuries. According to the History Channel, an astonishing discovery was made in about the Shroud in 1976 – something no other painting or artwork has – the encoding of 3D information. Despite decades of intense scientific investigation, the mechanism underlying the mysterious encoding of this three-dimensional data within the Shroud remains elusive. 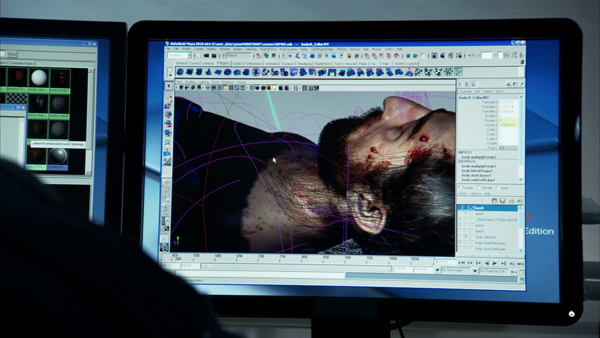 In the documentary, the computer graphics team is seen grappling with the faint Shroud image to wrestle out the hidden face within. Coaxing the image from the cloth proves to be no easy task. After months of work, a breakthrough: Downing focuses on the fact that the cloth would have been wrapped around the face of the man buried beneath. 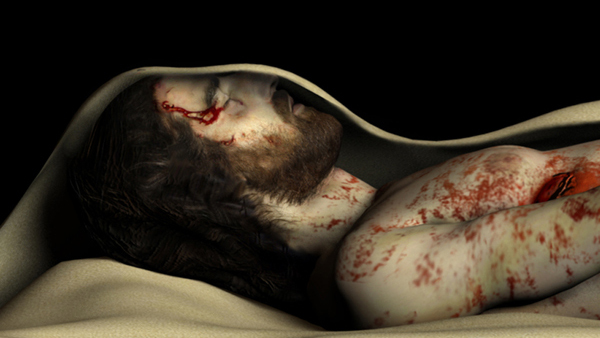 Downing is able to account for that distortion in the image and remove it, leaving an accurate, 3D portrait of the image presented on the Shroud of Turin. ‘I have a lot of information about that face and my estimation is we’re pretty darn close to what this man looked like,’ Downing told ABC News. For Ray Downing, the story of recreating the three-dimensional face from the shroud is entwined around another, even more important story. ‘There is the story of the Shroud which, artistically and scientifically, is the story of a transition from two-dimensional to three-dimensional,’ Downing says. ‘But there is as well the story of the man in the Shroud, and a record of His transformation from death to life”, Downing observes, “The two stories are intertwined, they seem to be one and the same”. Permanently stored and out of public view, this year The Shroud of Turin will have its first public exhibition in 10 years. Between April 10 and May 23, 2010, millions of people from all over the world are expected to visit it at the Cathedral of St. John the Baptist in Turin, Italy. According to the Vatican, Pope Benedict XVI plans to visit the Shroud on May 2, 2010. The Real face of Jesus is produced by Left/Right in conjunction with Studio Macbeth for HISTORY. Executive Producer is Ken Druckerman, co-Producer is Ray Downing. HISTORY Executive Producer is Carl H Lindahl. Posted in FindingFaith, God-spotting, MediaMoments, News.Tagged 3D, Easter, History, Jesus, Shroud of Turin. Although relics are of no importance to my faith, the Shroud is still quite an interesting artefact. Whether it actually is or isn’t the shroud of Jesus isn’t an important a question for me, but from what I can understand, the evidence is that it certainly could be the actual shroud of Jesus. A problem, with the argument that the shroud postdates Jesus’ crucifixion by more than 1000 years, is that routine crucifixion in the Roman empire was stopped around 300AD by Constantine. The pollen found in the Shroud points to it being from the Middle East, but I have read a valid-sounding counter-argument to this. The shroud is devoid of embalming spices; common practice in Jewish times as to embalm bodies for burial; this is lack of spices is consistent with scripture. Scientific examination hasn’t found evidence of forgery; to the contrary, the drip patterns of blood at the elbows instead of at the hands gives significant credibility to the shroud being one of a person who as actually crucified. All the other blood patterns are consistent with the gospel’s account of Jesus – the thorns on the head, whipping marks on the legs, nails through wrists and feet, and pierced side. The inscription reported by Dr. Barbara Frale is highly interesting but needs more scientific scrutiny. Evidently, somebody died just like Jesus did… or it was actually Jesus. I cannot think of a reason why somebody would want to die like Jesus, just to make a forgery, but that isn’t evidence. Did someone else die just like Jesus, at about the same time, and with a false or misread inscription? Overall, I haven’t read any evidence that can show that this Shroud couldn’t be Jesus’ actual shroud. Whether it actually is or not isn’t that important to me, but it sure is interesting. Finally, on a way-out-there almost wacky note, you could almost say that, with the airing of the show, The Real Face of Jesus, that nearly every eye may have seen or is just about to have seen seen the real face of Jesus… but I didn’t hear any trumpets. God Bless you Ray. For some reason Jesus our savior left this beautifull and awesome and powerfull image to show this generation of technology that he is a powerfull God and he is inded the creator of the univer and human kind. to God be the Glory, Power and Honor. Amen.